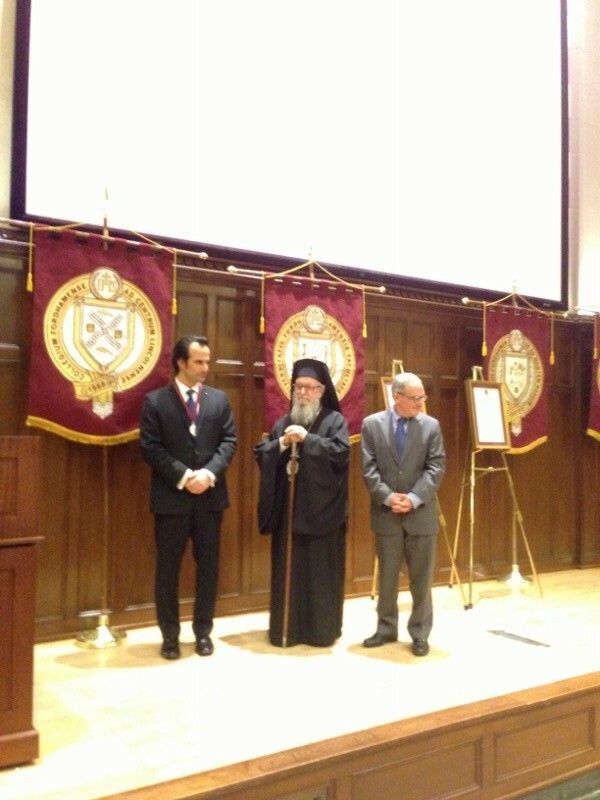 New York City, NY - Fordham University and members of the Orthodox Christian community celebrated a milestone on Nov. 18 with the installation of Aristotle Papanikoalou, Ph.D., as Fordham’s first Archbishop Demetrios Chair in Orthodox Theology and Culture. “I am honored to be the inaugural chair holder and I hope my work extends the remarkable legacy of Archbishop Demetrios,” said Papanikolaou, a professor of theology and the senior fellow and co-founder of Fordham’s Orthodox Christian Studies Center. У понедељак 18. новембра на престижном римокатоличком њујоршком универзитету Fordham, Rose Hill Campus, Bronx, отворена је у Америци прва катедра за Православно Богословље и Културу. Катедра је отворена у част и име грчког Архиепископа за Северну Америку Његовог Високопеосвештенства Господина Др. Димитриоса. За предавача на овој јединственој православној катедри постављен је реномирани професор теологије Aristotle Papanikolaou, Ph.D. Он је овим поводом одржао предавање на тему Violence and Virtue (Насиље и Врлина). Поред бројних уважених академских званица, свештенства и гости свечаности отварања катедре и пријему је присуствовао Протојер Ђокан Мајсторовић, старешина Саборног храма Св. Саве, Њујорк. The chair is the result of a $2 million gift from Mary and Michael Jaharis, of the Jaharis Family Foundation, Inc., which provides grants to arts, cultural, and religious institutions. Its establishment marks a first for Orthodox studies in the Western hemisphere and ensures the discipline’s perpetuity at Fordham. Moreover, by virtue of the its existence within Fordham, the chair will promote ecumenism and strengthen dialogue between the Eastern and Western Christian churches—a central mission of the center, which includes such events as the Patterson Triennial Conference in Orthodox/Catholic Relations. “To have the first chair in Orthodox theology housed in a Jesuit Catholic institution is important symbolically and practically as a sign of advancement for Orthodox-Catholic dialogue,” Demacopoulos said. The chair is named for His Eminence Archbishop Demetrios, primate of the Greek Orthodox Church in America. 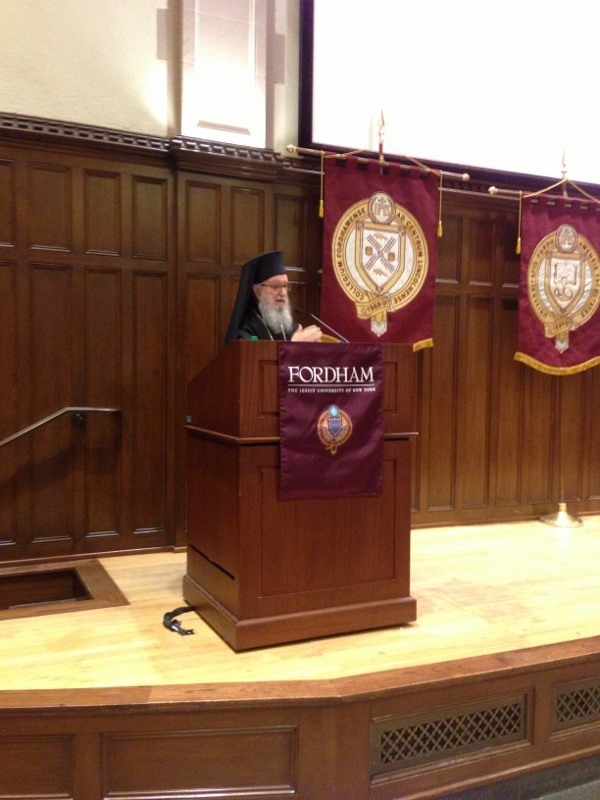 Archbishop Demetrios presented the inaugural lecture when the annual Orthodoxy in America Lecture Series began in 2004, and, in 2007, received an honorary doctorate of humane letters from Fordham. In addition to being leader of the Greek Orthodox Archdiocese’s 1.5 million members in America, he is a distinguished scholar of Orthodox Christian studies. Trained at Harvard and the University of Athens, he was the Distinguished Professor of Biblical Studies at Holy Cross Greek Orthodox School of Theology, where he met and taught Papanikolaou. A Fordham alumnus (FCRH ’88), Papanikolaou is a prolific author and eminent scholar. He is a senior fellow at Emory University’s Center for the Study of Law and Religion and the recipient of a Louisville Institute Sabbatical Grant for Researchers, which he used to explore how Eastern Christian notions of virtue understand the plight and healing of traumatized combat veterans. As the Archbishop Demetrios Chair, Papanikolaou will work to advance the study of the historical relationship between Orthodox Christianity and Hellenism. His inaugural lecture at the installation ceremony discussed how Eastern Christian thinking on virtue offers resources for illuminating and transfiguring the human experience of violence. Founded by Papanikolaou and Demacopoulos in 2007, the Orthodox Christian Studies Center is the first university-based site for Orthodox Christian Studies in the western hemisphere. Last year, the Center received a prestigious challenge grant from the National Endowment of the Humanities (NEH), one of the country’s largest funders of humanities programs. The $2 million endowment raised by a three-to-one matching grant will fund the center’s Distinguished Scholar-in-Residence program and Dissertation Completion Fellowship program.